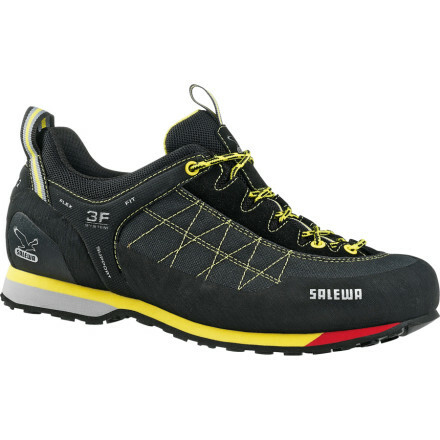 Superb updated lightweight hiker from Salewa. Comfortable out of the box, little break-in required. Many adjustment options to fashion a perfect fit. Need to loop laces down again from first to second level hooks to tie securely. This is the new updated 2015 Mountain Trainer Mid GTX from Salewa. Nice looking and distinctive. Color is brown nubuk with silver, yellow and red sole trim. The "to-the-toe" lacing system is a plus not usually found in a regular hiking boots and allows you to dial in a perfect surround fit. There are two sets of double layer insoles (the extra set is found in a plain white box in the packaging—don't toss this accidentally!) so you should find a comfortable width option whether you have a somewhat wider or narrower foot. Boot is lightweight with a firm and sturdy outsole, seems to grip well so far. Only downside is a somewhat stiff and thinly padded upper, but this has not proved a liability so far in actual hiking. 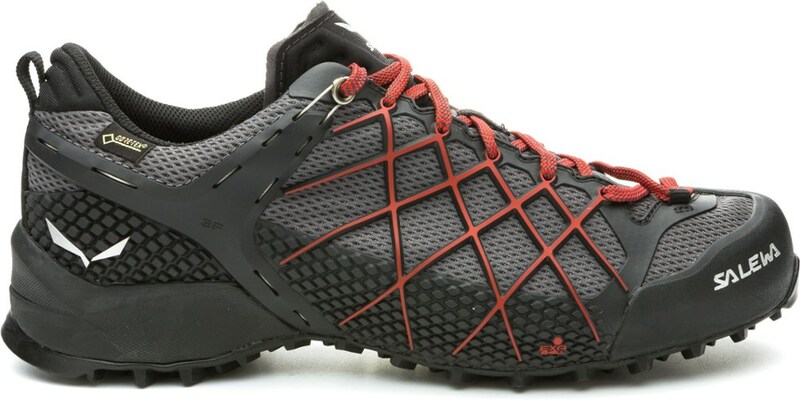 I am a seasoned boot user, but after reading a number of opinion blogs I thought I would try a hiking shoe. 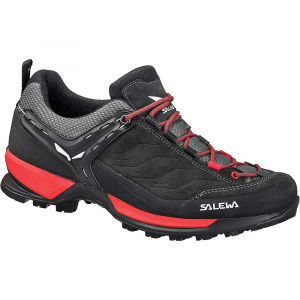 The Salewa Mountain Trainer has turned out to be a very pleasant surprise. While not as comfortable on my foot as my Aslo boots are, they have proven to be a very solid shoe and I really appreciate the lighter footwear compared to my boots. The shoe fits great. While it did require a good deal of time to break in, the shoe is relatively comfortable now. I have about 100 miles on the shoes now and I would highly recommend these shoes to anyone. Welcome to Trailspace, Beachboy. Do you have any pictures you could post of your shoes? The Salewa Mountain Trainer GTX is a comfortable, exceptionally-made if somewhat pricey all-around hiking shoe. Appearance, fit, comfort and utility combine to make this an ideal choice for active hikers with larger budgets. Fit: As with any shoe, especially hiking shoes that will take a beating and need to protect one's feet, the Salewa fits quite well. 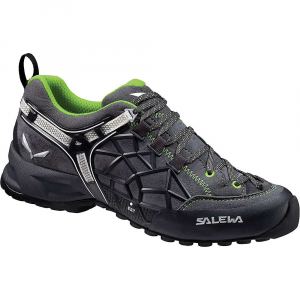 I wear a size 11 shoe, whether it's casual, work or exercise and the Salewa fit perfectly. When I walk I am always conscious of the fit across the instep, the heel cup and the insole. The Salewa is great in all three categories. Most of my walking/hiking is done on urban trails with few, if any, little technical details. For years I have used Saucony or Asics trail runners. I notice that the heal cups wear out quickly, the heel wears down and it's sometime difficult to get a comfortable fit across the instep. With the Salewas, one of the fist things I noticed was the well-finished heel cup. I've been wearing them only for a week, but my heel doesn't move around much so I think these will last. Also, the insole is a two-piece design with excellent cushioning. I do suffer from plantar fasciitis and, while support and cushioning are comfortablle, there is not as much arch support as those shoe brands that promote this feature. It should be noted that Salewa makes no mention of arch support, etc., so this is NOT a knock against the shoe. Lastly, the padded tongue and thick laces provide a secure, comfortable fit. Comfort: I immediately noticed two things when I laced up my shoes. First the shoes are solid and heavy. Not an ideal shoe for quick movement. As I said, I'm used to lightweight trail runners, so the additional weight takes some getting used to. Although it's cut like a standard athletic shoe, it weights more like a mid-cut boot. The second thing I noticed was the SOLID construction. This shoe feels like it's built for mountaineering! The sole is solid and grippy. No lateral foot movement, sliding in the heel cup, etc. One feels like one can literally go climb a mountain in these. The toe box is rooming and no pinching even with thinker light weight hiking socks. Not sure how a very thick heavy-weight sock would fit as I haven't tried that yet. There still a bit stiff because they are so new. Support: As noted above, support and fit are excellent. This is a low-cut shoe, so I'm not looking for a lot of ankle support, but the shoe is solid and I would feel comfortable bouldering or scrambling over scree. Water Resistance: If it's designed to keep your feet dry, does it? Traction: This shoe is the GTX model, so I think it's designed with wet conditions in mind. So far so good. the Vibram sole is stiff and grippy and designed for technical mountaineering conditions. The lugs are not so large that one feels like one is wearing waffle-stompers or that small pebbles etc. will get caught in the treads. Temp Control: So far so good. I've worn them in humid mid-70s weather and low 50s. She shoes are comfortable and my feet are warm and DRY without over-heating. I suspect that in very hot conditions the shoe may heat up because of the solid, water-proof construction. Definitely the opposite of the lightweight, breathable trail runners I usually wear. Ease of Use: The shoes are easy to put on and lace up. No complicated lacing system here. My only complaint is that the very-simply eyelet system makes it hard to get a truly customized fit across the entire foot. That said, there is some give and I think they could be cinched up pretty tight. 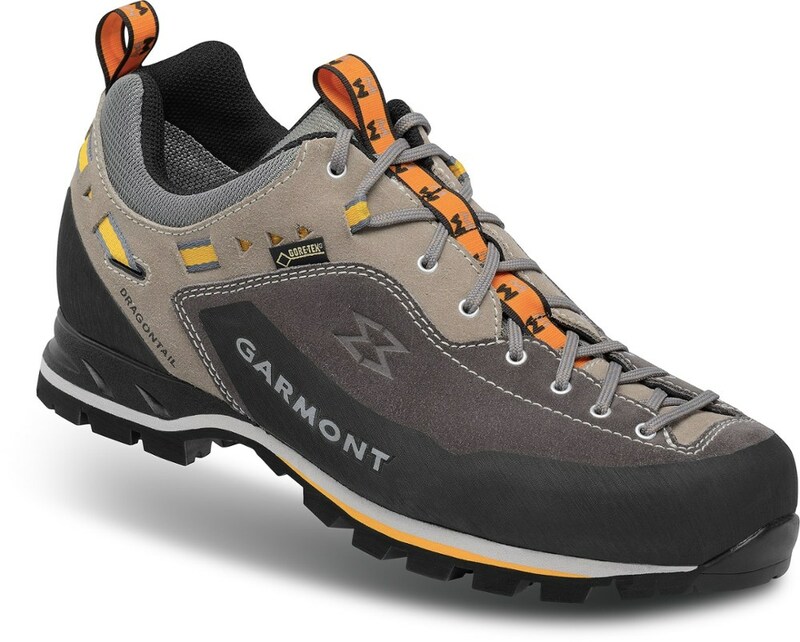 Features: The two noteworthy features are the GTX (waterproof) and solid construction. As noted above, these are made like mountaineering boots. Surprisingly, the sole and toe box appear somewhat narrow (maybe because I'm used to a wider trail running shoe). However, there shoe fits very comfortable. I usally size up a half size in my street running shoes to accommodate my toes. No pinching in the Salewas which run true-to-size. Construction & Durability: These shoes are built for mountains. The sole is tough and durable, as are all parts of the upper. They look and feel like they could easily withstand tough, technical mountain/trail terrain. I really like the hardened finish around the toe and along the bottom of the shoe wear the sole meets the upper. Clearly constructed with the intent to withstand sharp, gravelly trail conditions. Conditions: As stated above, I've had these for a week and worn them only walking/hiking on urban trails with few technical conditions. I've walked through dewy morning fields and the GTX waterproofing is impeccable. Final Remarks: This is a stylish well-made shoe. I originally bought the acid-green but exchanegd them for black because I wear them to work in an urban environment and the green was little too much for my style. If I bought these only for extreme outdoor use, I would have stuck wiht the bright color. 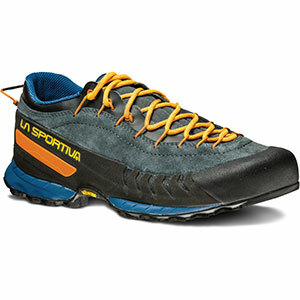 These are an ideal shoe for someone with the budget for a sturdy, waterproof technical mountain approach/hiking shoe. I'm really happy with my purchase.